YoYo Games says it will remove "destructive" copy protection from GameMaker Studio but won't give up on DRM. GameMaker Studio developer YoYo Games has acknowledged that many legitimate owners of its software had their game resources permanently trashed after its DRM system went "haywire." The issue first came to light late last week when a user reported a "weird GM Studio error" that had changed all his sprites to skulls and crossed swords. He was initially accused of using a pirated copy of the program but a YoYo employee quickly stepped in and said that "sometimes a virus or something can effect an exe and gives some issue like this." Unfortunately for many GameMaker users, the problem is much more widespread than just that. 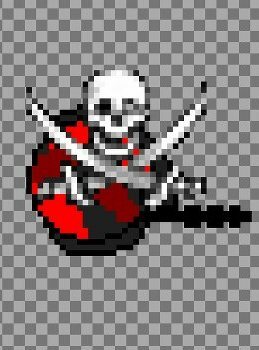 "Those who use a legally obtained version of Studio have had game resources, such as sprites, overlayed with an image of a skull and crossbones. The resources are permanently edited, rendered useless," a GameMaker Blog post states. "Although staff have encouraged users to run virus scans on their computers to ensure the program was not tampered with, reports of the issue have become more widespread suggesting it is an official bug and not an anomaly." An official fix hasn't been released at this point but the "current solution" is to uninstall the program, delete %appdata%GameMaker-Studio and %localappdata%GameMaker-Studio, delete the GameMaker Studio registry key, perform a full system scan to ensure that you haven't actually picked up a virus and then reinstall the whole thing. If that doesn't work, users may contact YoYo's help desk "and we'll see what we can do to help." It's an ugly situation, but in spite of an admission that it's "hard to argue at this stage" that DRM doesn't cause trouble for anyone but legitimate users, the studio says it won't do away with it. "We'd LOVE to be able to remove the protection completely, but we know that vast numbers would simply copy it if it was that easy," YoYo's Mike Dailly wrote. "There are many levels to the current protection system, and while many are visible like this, there are also many hidden so that we can always tell when a final game was created with a crack." "We expect an update to go out tomorrow to remove this protection, and will move away from the 'destructive' protection like this, to more passive methods to help protect innocent users who through no fault of their own, somehow trigger it," he continued. "As to why we don't just switch into FREE mode, this is because crackers can simply activate features while the program is running, so doing this serves no purpose other than to annoy paying customers." YoYo's desire to avoid annoying its paying customers is admirable, but I can't shake the feeling that it's going about it the wrong way.